The Alexander Technique is a powerful tool for change and for personal development. We look at how our ideas affect how we move and we learn ways to move more effectively and efficiently by changing our ideas. Lessons take place in activity, the students choose their own activities. Through the lessons we learn processes and principles which we can apply, not just to movement but to the rest of our lives. I teach according to the Interactive Teaching Method (ITM) approach which involves applying reason and reasoning to our movement behaviours. If you are new to the Alexander Technique or the ITM format the place to start is with an Introductory Class. If you’ve already been introduced I recommend taking a short series of lessons. Contact me to book a lesson or ask any questions. 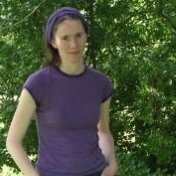 Hi, I'm Nicola, I run Alexander Technique courses and classes in Edinburgh.